ClubCoin Gereken: 170 Please note that, for now, you cannot download content from our platform directly onto a mobile device (phone, iPod, iPad, tablets...). You need to download your items onto a PC or Mac, and then transfer them onto your device in the normal way. We are working on allowing direct downloads to mobile devices but this is not possible in the current version of the platform. Sorry about the inconvenience! The lethal stuff of legends For Jessica Tregarth, an unexpected invitation to visit her grandfather in England comes as a wonderful surprise, an opportunity to open doors to a family history that have always been closed to her. But her arrival is greeted by mysterious villains who pursue her through Cornwall, their motive and intentions unknown. Jessica's only clue is an antique heirloom she posse… sses, an ancient ring that bears the Tregarth family crest. Her only ally is handsome gothic novelist David Randall-her self-proclaimed protector-who appears seemingly out of nowhere to help her solve a five hundred-year-old puzzle. 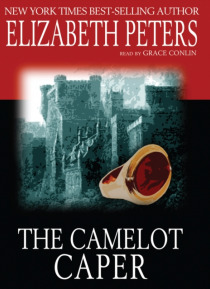 Something out of the cloudy mists of Arthurian lore has come back to plague a frightened American abroad, and a remarkable truth about a fabled king and a medieval treasure could ultimately make Jess Tregarth very rich-or very dead.